Gamelan Salukat is a set of new 7–tone gamelan developed by Dewa Alit. 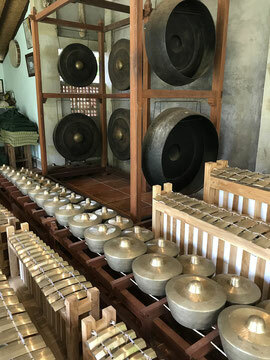 The tuning as well as the spirit derives from the ancient Balinese gamelan ensembles such as Selonding, Gambang, Gong Luang and Semara Pagulingan. This unique gamelan is a reflection of Dewa Alit’s strong root in traditional music as well as his hope to accommodate challenges he faces in creating new path in Balinese gamelan music. The members of Gamelan Salukat consists of some 25 young musicians from Ubud area. Juggling mobile phones and gamelan mallets, they are not only musicians with high skill and knowledge in traditional gamelan, but also are enthusiastic about being on the very front line in the new gamelan music scene. Many of them have been working with Dewa Alit from very young and Salukat has experience performing with world-acknowledged musicians including American composer Evan Ziporyn and Bang on A Can All Stars.